You know that I love my garden and April, May and June are my favourite garden months. In April I had the fortune to see Kaviraj and Christine Maute in a seminar/tutorial on using homeopathy in the garden as well as in agriculture. It has been very interesting and since then I have used several remedies on my plants. In February we had a sudden cold spell over nearly 4 weeks. Many plants suffered from it. Most of my roses had severe problems. One “died” and I had to replace it with a stronger version. If I had known that aconite is the remedy to give even during winter after a very cold period on sunny day’s maybe this rose would have made it as well. My neighbour has a cherry tree. The leaves would not grow properly and the bloom died, dried and turned black. This was due to a second very cold and wet period beginning of April. I started with Aconite C200 once. It seemed that some new leaves started to grow. 1 week later I gave kali-c. C200. Many new leaves started to grow, but a fungus was on nearly every leave even the new ones. So I remembered that red dots ask for belladonna and secondly that belladonna is like a hot tea for a tree! So I gave the cherry tree a bell C200 – and only 2 days later the fungus on the leaves started to dry out and the red dots would turn brown and fall out of the leave. This is the second time that I can witness this. So the leave stays on the tree and looks like an Emmenthal cheese. This is not the first year that I use homeopathy in my garden, but now I keep a record of everything I do in my garden and also the following results. But not all I did was so successful...but I keep on trying. A handy guide to the most common plant diseases, pests and damage with information on how to treat them homeopathically. Christiane Maute is a pioneer in this field, who started treating the useful and ornamental plants in her garden with homeopathy ten years ago. The way in which plants react to homeopathic treatment is in many cases astonishing. Ms. Maute gives the main homeopathic remedies for all the most common diseases, such as leaf spot on roses, tomato blight, fire blight on fruit trees, aphids, leaf curl, cancer, mildew, fruit rot and sooty mould, along with problems like slug infestation and weak growth. Treatments for the consequences of frost and hail damage, exposure to excess damp, heat and sunlight, as well as ‘wounds’ inflicted when pruning or repotting are also explained clearly, so that any amateur gardener can use them. Useful illustrations and brief notes are supplied for most of the diseases discussed, enabling even the novice to recognise the ailment at a glance and easily find the right remedy. The dosage and treatment method are described in detail. The book is rounded off by a short, clear materia medica giving information on each remedy. A guide particularly suitable for amateur gardeners which is easy to follow and will quickly turn even ‘non-homeopaths’ into enthusiastic users. This book has in fact turned out to be the most efficient ways to spread homeopathy in general. Some people would not dare to treat their dog or their husband themselves (:-) but they are curious to try homeopathy on aphids. As this often works miraculously many fall in love with homeopathy and dive deeper into the subject. Abspieldauer (ca.) 18 Std. 34 Min. Im Spannungsfeld zwischen dem Dunklen und dem Lichten, zwischen Magie und Ratio, trifft menschliche Leidenschaft auf Vernunft. Nachtschattengewächse (Solanaceen) werden schon seit der Antike von Hexen, Alchemisten und Heilkünstlern verehrt und gefürchtet zugleich - als faszinierendste, verrückteste und unheimlichste aller Pflanzenfamilien überhaupt. In einer einmaligen Verbindung aus praktisch-homöopathischer Erfahrung und theoretisch-geistvoller Ergründung geleiten uns Dr. Norbert Enders (einer der ältesten und erfahrensten homöopathischen Ärzte Europas) und sein Counterpart Dr. Dieter Elendt (homöopathischer Arzt, Autor, Erforscher literarischer und filmischer Bezüge zu Arzneiwesen) auf eine Tiefenexkursion ins Reich der Schatten - mit ebenso faszinierenden wie erschreckenden Einblicken in die Abgründe der menschlichen Seele. 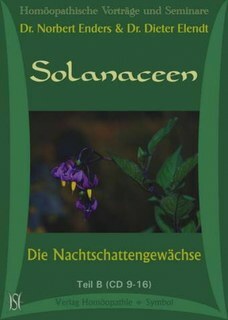 Die drei großen, bekannten Vertreter der Solanaceen - Belladonna (Königin der Nacht), Stramonium (explosives Gemisch aus Wahnsinn und Gewalt) und Hyoscyamus (Eros und Narr in zorniger Umarmung) sowie ihre weniger bekannten Verwandten Mandragora, Dulcamara, Capsicum und Tabacum, lassen den Konflikt zwischen Zauberwelt und Zivilisation, Wildheit und Anpassung offen zutage treten. Wo gibt es sie noch, die wilden, unkontrollierten Gebiete jenseits der neuzeitlichen Rationalität, an den Grenzen und Übergängen zwischen Tag und Nacht, Bewusstem und Unbewusstem? Bei der Ergründung dieser zunächst schwer zugänglichen Grenzräume stellt sich, auch ganz praktisch homöopathisch, die Frage nach dem Ursprung und der Dynamik von Nachtschattenpathologien im homöopathischen Alltag. In welchen Erscheinungsformen begegnen uns ihre oftmals erschreckenden Gemütspathologien? Wie haben sie sich entwickelt? Was sind mögliche auslösende Erlebnisse? Welche zentralen seelischen Themen werden dabei angesprochen? Zu welchen Kompensationsstrategien greifen die Betroffenen? Hi Claudia. Great tips and tricks in the garden to overcome seasonal changes in weather that challenge our plants. My passion is getting all these experiences together so I would like to add what you have written to the materia medica at considera.org/matmed . Are you OK with that? I'm glad you are keeping records. If they were all put on the materia medica then they will be useful far and wide. I have met again recently with Dr Waris who had the very positive independently assessed results with mealy bug in cotton. For frost and cold he recommends aconite too, and also silicea. Carbo veg can give warmth too in his opinion. For warm days and cold nights he recommends dulcamara. From the biodynamic stable there is valerian and a potentised version of that has had very widespread and independently tested success and it is know as ThermoMax. What was the thinking that made you chose the Kali-c?